Six Nigerians on Tuesday appeared before an Accra circuit court charged with various offences ranging from impersonation, forgery of document, possession of forged documents, conspiracy to commit crime and defrauding by false pretences. The six, Alex Owheri, alias Nii Kotey Ashie, Stanley Ufoma Shekiri, alias Volta Security Officer, Eric Michael, alias Chemical Dealer, Kelechi Jolly Chukwumeychey, Manice Enues Chukudi, alias Barrister’s driver and Jimi Sulemana Abass, alias Abacha. They all pleaded not guilty and were remanded into prison custody to reappear on August 21. Four of them were charged for conspiracy to commit crime and defrauding by false pretence, whilst Alex Owheri and Eric Michael were charged for forgery of documents. The facts of the case as presented by Deputy Superintendant of Police Abraham Annor are that, the complainant Jiri Marcanik is a Czech National, whilst all the accused persons are Nigerians living in Ghana. He said about four years ago, the suspects at various times conspired and lured the complainant with the promise that they could assist him to buy gold in Ghana. DSP Annor said in the course of the negotiations, the suspects succeeded in defrauding the complainant to the tune of $11,500 and 30,000. He said Alex, the first accused, posed as one lawyer Kotey Ashie and forged various documents consisting of an application endorsement form with the coat of arms and office of the president embossed on it, a Ministry of External Affairs receipt No. 0523, with a face value of $8,700. He also forged a UN Security Department Appointment permit, a Ghana Bar Association document certifying the name of Lawyer Kotey Ashie as a true member of the association, a UN Money Laundering certificate, IRS Tax Clearance certificate and a Non-Inspection Movement certificate. The prosecution told the court that these documents were used in enticing complainant into parting with various sums of monies to the suspects. He said on July 28, one Peter, now at large, together with Alex, Ufoma, Eric, Kelechi and Manice informed the complainant on his arrival to Ghana on July 20 that the gold had been impounded by the Police. The prosecutor said Peter and Ufoma then demanded 2,000 dollars, from complainant to give to the Police for the release of the gold, while Alex also demanded an extra cash of 3,100 dollars for demurrage. The prosecution said on July 31, Alex, Ufoma, Eric, Kelechi and Manice called complainant on different occasions to meet them with $7,100 for the settlements. He said the complainant became suspicious and informed the Police about the activities of the suspects. The complainant then arranged with the Police to have them arrested. 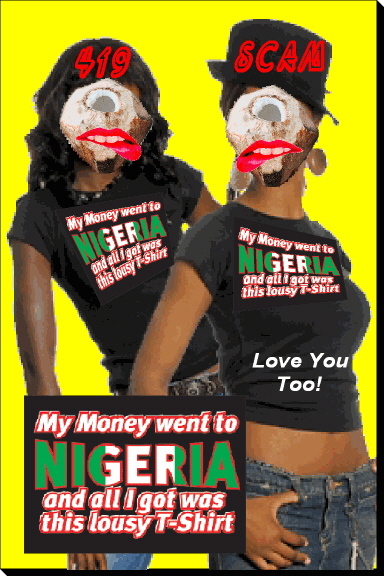 Alex was arrested with all his forged documents whilst Eric was arrested in the company of Kelechi. DSP Annan told the court that Jimi later called and directed complainant to come along with the $2,000 to the Kingsby roundabout area in Achimota, to enable him to inspect the gold, but he was trailed and arrested. He said on August 1, their various apartments were searched and a lot of SIM Cards, clandestine documents for defrauding their victims and a laptop with a forged soft copy of Ecobank International Certificate and other documents were uncovered. * Advise: NEVER send money to Ghana / Africa without a background check! 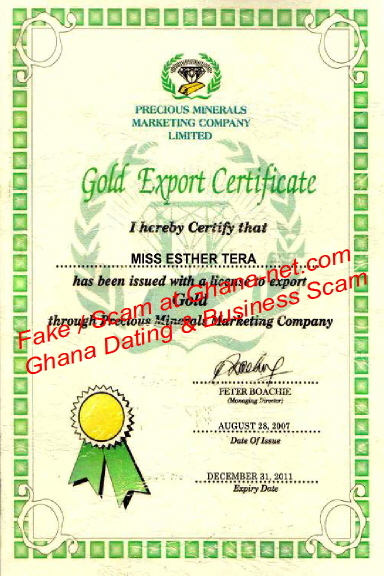 There are many fraudsters out, using fake hospitals and non existent white girls, to get your money!